Kathy Sierra speaks out in an interview with a local TV station. It is a good one to listen to if you're trying to understand what has happened. I recorded a podcast at 6 a.m. this morning (my tiredness really shows in my voice.) It is the day of prom and we have a half day today. I wanted to share my thoughts. After recording this morning, I found to my dismay that the chipmunk effect had struck my own blog. So, I followed the instructions to fix it. Unfortunately my introduction is now talking super slow! Aurgh! I'm sharing this with you. I wanted to tell the story of the pike (a fish) and the elephant and how it relates to cyberbullying. It is a 28 minute podcast. that they take anything from me? no one knows any of us." does anyone care a bit? i talk to the world each day. Prominent blogger Kathy Sierra revealed this week (warning, her post contains explicit language) the death threats and cyberbullying she has experienced and calls on the blogging community to stand up for a code of ethics that rejects such behavior. Andy Carvin echoed and asked that we proclaim today "Stop Cyberbullying Day." I am observing it, are you? IM speak is full of the whole range of human emotions, including great sadness! Will you commemorate this day with me? What can you do to Stop Cyberbullying Today? 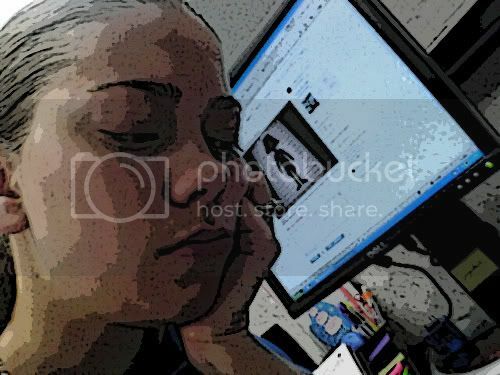 href="http://www.technorati.com/tag/stopcyberbullying" rel="tag" >stopcyberbullying</a>. Speak up in your sphere of influence: the classroom, the PTO, the civic group, the government agency, the educators organization. Make sure this is a topic that your teachers learn about and understand. We must become a cacophony of voices speaking out about how to be wise, civil, and successful online. We are educators. We teach. We stamp out ignorance. online life will be like in 10 or 20 years. stamp out cyberbullying and most importantly, share! And, we need to come up with (and use) new emoticons, one that communicates innappopriate, unethical behavior by a blogger. Note to my readers: The use of lowercase letters in the poem was intentional as was the use of punctuation. I always talk about the appropriate use of IM speak, in this case, I have a message to convey and wrote this as if I was a teenager online. Kudos to Scott McLeod's space badges for cyberbullying. I'm going to add one. This one is my favorite. Just saw a video that my friend Lisa posted over at the Cyberbullying group. I think you should show this video to students and teachers! It sends a message that we as educators are ready to band together and discuss and share in a meaningful way. That we can learn new things and new technology to communicate and share with one another across all boundaries for the good of the students we love and desire to teach. Join in! There is strength in numbers. We need to be discussing the issues of Cyberbullying. PLEASE join and ask everyone you to know to as well! It is over at http://stopcyberbullying.ning.com/. It will be great in my post tomorrow at Tech Learning to be able to share that we have a lot of educators over there that have joined the network to discuss this! Let's get hundreds of educators to join in and discuss! If it is blocked, ask your tech administrator to JUST unblock stopcyberbullying.ning.com -- and leave all of the other ning sites blocked. (It was blocked on my firewall.) You could copy this into your e-mail. I am beginning to work with a group of international educators to stop cyberbullying in schools. We are discussing what we can do to help this issue in ways that are legally responsible and sensitive to the needs of students. Andy Carvin, the PBS education blogger, has created a website to allow us to discuss and share best practices so that I can pass this along to the people at our school and I would like to join. Unfortunately it is at a new website called ning and it is blocked at our school. Could you unblock http://stopcyberbullying.ning.com/ so that I can join in the discussion and keep up with the innovation going on in this area. We have a responsibility to help with this problem which is crossing school and even country lines. If you unblock, I hope you'll help me pass along this website so that we can get other teachers here to be aware of and understand this important issue. Thank you! Please e-mail me at ____ to let me know what you decide. I eagerly look forward to your response. How are you showing your support for Kathy Sierra tomorrow? (I think we should support her by DOING something not by NOT DOING something!) Get out there! Vicki Davis slightly changed Wes Fryer's podcast by adding in new annotations. Who's the creator of the podcast that Vicki placed on Innertoob, Vicki or Wes? Does it matter? Is there a certain point at which the product ceases to be Wes's and becomes Vicki's? These are the issues we must ponder and discuss! Wes Fryer released a phenomenal cyberbullying presentation via podcast last month accompanied by an incredible wiki that you should review concerning cyberbullying. I am just learning about this service so I may be wrong about the technical details of it! It seems VERY useful to me at first use! Dear Kathy Sierra: Anti-Cyberbullying Day Friday March 30th is for you! This is a letter written to techno-guru and inspiration Kathy Sierra who has several times stooped from the heights of Technorati greatness to link to my blog and encourage me in my learning. She as been experiencing a barrage of death threats and incidents and the blogging community is angry! I am livid! Here is my open letter to her. The educational community (and many others) is behind you. What has happened to you is reprehensible, and in my opinion, illegal. Andy Carvin is calling for an anti-cyberbullying day on this Friday, March 30th and I'm with him. My post over on Tech Learning will be dedicated to you and on this topic of cyberbullying. I'm sorry for what has happened and I will be praying for you to be strong and continue to be vocal. You already have a platform, now you have a cause that can impact the world: Internet freedom and safety. For truly it is not freedom when one limits the freedom of another. We are free to own a gun, but not to shoot another human being. We are free to own a car, but not to run another person down. We are free to use scissors, but not to stab someone with them. The moment a certain degree of harm is inflicted on another, we lose the freedom to use that item. This is not about their freedom of speech, but about your freedom from fear. And what happens now is very important because it sets a precedent for what happens in the future. Truly, you have a pivotal place in history and time because this one incident, if fought and won, can be used to protect the electronic safety of generations to come. We need free speech on the Internet and the freedom to write on our blogs. But we also need to have the ethics and professionalism to interact with the sensitivity that there are living breathing people on the other side of the words on a page. Our society is sadly lacking in techno-personal skills and it is time for more schools to do something about it! But, we have allowed our reality driven, happy slapping, Borat-praising cultural tendencies that say it is OK to harm another as long as you "get famous" to go too far. I cannot deal with these people, that is for the authorities to do, but I can do something within my tiny sphere of influence: I can advocate change in all schools so that we do not produce more people like these who have threatened you! If you podcast, please record a podcast. If you video, release a video. Use blocking for good for a change -- block the site meankids.org and don't go there your self. Certainly, do not give them a link! Write a letter to your local newspaper advocating Internet safety education at the K-12 level and include the importance of using these tools to stamp out the growing ignorance. Education is the answer, not blocking. Propose or share something you think is effective. Kathy, this is a terrible thing, but perhaps if we educators band together and DO something to stop future cyberbullying, you can experience some solace in that. I ask my friends in the edublogosphere to join me with all of my heart. "Bloggers are liars. They use all sort of ways to cheat others. From what I know, out of 10,000 unemployed bloggers, 8,000 are women. He asked people not to believe bloggers and gamble away Malaysia’s future because 50 years of Merdeka (Independence) takes a lot to achieve it." He was responding to Indonesian journalist, Nila Tanzil who had posted some unfavorable things about the Malaysian government. Dear Nila, it's a brave new world, we walk with you ! Blogging has become a force in the world and many do not like it. It gives an accountability and a voice to those that some in power believe "do not deserve a voice," in this case a woman journalist from another country in a society that does not value the feminine gender. 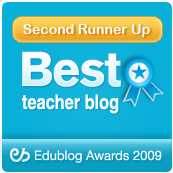 Perhaps I see the echoes of those who tell teachers not to blog? Effective, professional, blogging has an impact. If you want to change the world, perhaps your best choice is to blog. If you want students to change the world, perhaps we should teach them to blog. This video gives me chills! Simon's (from educating the dragon) video response over at Teacher Tube to my question "Why should we teach technology to students?" (from my Technology Fear factor video) gives me chills. Teacher tube is really starting to get a lot of your contributions. Here is the nice thing about it -- youtube has a 10 minute limit so I have 5-6 videos I couldn't upload there but had to use Google Video. Also, it seems like teacher tube is not blocked at many schools! The Technology Fear Factor video has had 3064 views at Teacher Tube and 210 views on youtube! We may need to use teacher tube just for these reasons. My favorite podcast: Relationships that Break down barriers! I love listening to podcasts! The world is available for us to listen to for free! One of my favorites is the Zig Ziglar Inspire podcast. Although many people in the business world love him, I listen because he talks about such important things about having a good attitude, working with people, having a good marriage, and faith. This weeks show is "Relationships that Break Down Barriers." At the beginning he talks about the relationships that have influenced him most and that if he had limited himself to only associating and learning from those just like himself, that the five most influential people in his life would never have reached him! It is a great listen and reminds me of the importance of reaching out and learning from a wide variety of people! It is very inspiring! Back over to Teacher Tube: When laughter turns to tears! I got this off teacher tube. I think it is a great example of folks having a sense of humor. Meanwhile -- some other videos are cropping up that make you think. And my laughter turned to tears! If you're teaching about the Holocaust, have the students watch the video below, then, after studying the Holocaust, have them create a video response! Give students a reason! They love to interact with their peers and this gives them a great method of virtual interaction. Sadly, this video says only a little over 50% of our school aged students know what the holocaust is! I would love for such videos to include citations at the end, particularly if we're going to use them in the classroom. It is important to be able to cite your source! Will Teacher Tube Take Off? I don't know. It is a very needed resource and will only do as well as those who rate and evaluate it. I like the idea. Can anyone say -- video filtration? podcast filtration? We need a way to let the good stuff in and keep the junk out! It seems like such a method could be invented! Great feedback, I hope you'll fill out my survey too! 1) I'm going to give more contrast to the body of my blog. (Thanks Christy Tucker for your link the comments to the Juicy Studio Color Contrast Analyzer. Cool tool! 2) I am going to redesign the header, I think. 3) Many of you are saying you like shorter posts. I'm considering the merits of researching a topic and breaking them into smaller posts and doing a series. The drawback with this method is that a person who wishes to respond to the entire topic has to link to all three or the latter one. Still thinking on this one. 4) Tell me what you think! 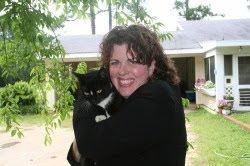 Cool Cat Teacher's Quest for a Cool Site: Come See My New Site! It is important to me to do a good job. I survey my students (It makes me a better teacher!) each year to see what they liked and didn't like. I want to know what helped them learn. Now, I'm asking you! What do you like? What do you wish I'd tell you more about? So, I'm asking you to take a small six question survey to help me improve my blogging. In particular, I'm debating on the graphic in my title bar (at the top) that came with this template. Is it too risque for me? Do I need to redesign it? Please give me your feedback. I am going to share my answers over spring break so that you bloggers can learn from this feedback as well. Meanwhile, I look forward to your feedback and hope you'll take the survey! I customized a blogger template at one of the free blogger sites and it took some real HTML coding to get just like I wanted it. Unfortunately, you cannot really use Blogger 2 and these templates and you have to understand a little about HTML (particularly TD and TR tags for tables). Remember, if you do this, notepad is your best friend! Copy and paste your old template into notepad before you ever start! I also went back to all of the places where I do things online and snagged their newest codes for how to do things! So, help me be better and I'll share more with you later! Been a busy day and I'm ready for a little chair therapy! I dedicate this to my mentor and the inspiration who got me started, David Warlick. He's been talking about the power of video in telling the story of technology in education! I am now preparing for my first conference, the Tech Forum in Chicago and with the help of some of my students, I have created a video that expresses how I feel about the state of technology education. I base many of my opinions upon what I read from the Computer Science Teachers of America (CSTA) so I consider it fact, not opinion. It applies to many other countries around the world. Why do we need to use technology in schools? OH, and thanks to Danita Russell for tipping me about Teacher Tube, I've uploaded the video there as well. Perhaps it should be unblocked for many of you. I made the decision to install Office 2007 knowing that the textbooks aren't available yet. We've been comparing and contrasting Excel XP and Excel 2007 and creating our own textbook for about two weeks now with excellent results! But now we have one week until spring break and I want some excitement! These are great moments that can either drone on or can be used as exciting, stimulating times of learning and I teach computer fundamentals, so I have the world at my fingertips. So, meet my Amazing spring Break Project! Your project will have three sheets. It will be turned in by e-mailing it as an attachment to Mrs. Vicki at **My e-mail** by Thursday, March 29, 2007. It must be saved as an excel 2007 worksheet. You have $5000 to spend this spring break to go anywhere in the world from Camilla, Georgia. You are creating a spreadsheet to share with your friends about this trip. It will include an interactive map showing the stops and places you’ll go. It will include a budget worksheet that will show how all of your money will be spent. You will also create a poster that will print out on 4 sheets of paper that you will cut and paste together about your trip. If you have time, you will create a word find (and answers) to get them excited about where you are going. This is not a team project although two of you may go to the same place. You will create an interactive map of where you are going (if you don’t know where you’re going , then make up a place anywhere in the world in which you will go.) The name of this Tab is: Map of ___ where the blank includes the name of the place you are going. · You must insert a map of where you are going as the background. · Insert at least 15 comments about the places you will go on the map in the proper location. (Right click and select “insert comment”) These will pop up when someone puts their mouse over them. · You must also include at least 5 hyperlinks. · You must have 4 additional pictures. · One of the pictures must be a hyperlink. · At least 5 comments as needed to explain any items that may have questions including flight arrangements and times if you are flying somewhere. · A chart of some type to help interpret the information in your budget. You will make a large poster at least 2 sheets of paper wide and 2 sheets of paper tall in color. You will print it on the color printer, cut it out and paste it together. The title is My Amazing Spring Break. Include the chart about your financial data. Include your map and other information promoting your trip. You are to create a Word Find using Excel to help your friends get excited about what you will be doing on this trip. (See http://pirate.shu.edu/~medealyn/MicroComputing/page3.htm for an example.) You must have one page as the word find and one page as the answers. Include your answers to the word find like the example shown. So, this will be fun and I'm excited. The moral obligation to prepare students for the outside! This quote from Scott over at Dangerously Irrelevant. The school district is legally obligated to protect our students from the outside. It is not legally obligated to prepare them for the outside. It's like the picture to the right -- if we didn't teach how to drive around a curve in driver's ed. If we didn't teach brakes in drivers' ed, how many kids would hit this wall? "This statement elevates CYA thinking over social justice concerns about technology access/usage and workforce preparation for disadvantaged students. This statement is reactive, not proactive, at a time when we desperately need forward-thinking school leaders." Scott's post is dangerously RELEVANT and the comments are incredible! Preparing our young for their release into "the wild"
If I was preparing to release an animal into the wild, I would slowly acclimate that animal to what it would experience there. For, by coddling, sheltering it, hand feeding it, and giving it everything I would prepare it for a dramatic, sudden and very probable death upon its release. Which is the greater negligence? That of creating a slight amount of discomfort before release or that of totally not preparing the animal for life outside of the comforts of captivity. We see it in nature when mother eagles literally push their young out of the nest to force them to try their wings while under the mothers attentive watchcare. But kids aren't in a cage -- if you don't teach them at school, they go home and teach themselves. They teach each other how to do things, but in true teenage fashion -- never stop to discuss if they SHOULD do those things. That is our job! With cars, teenagers know how to press the gas pedal, but unless someone teaches them why and when to take their foot off the gas pedal -- they will face a probable fiery, death amidst flame, iron, and steel or even worse, take others with them! Look at all of the resources put into drivers ed. I believe technology education is as important. And kids don't just "automatically" understand computers -- I teach it and I know that there is a big difference between learning how to set up a myspace account on your own and understanding the technological nuances of today's technology-heavy world. Our job is to get kids ready to be successful adults. People with integrity who will respect their elders. People who know the meaning of hard work and have the empathy to weigh decisions that affect others. People who care and know that it is more important to stand up for what is right than to cave to selfishness. People who consider the plight of the helpless and respond with empathy, kindness, and consideration for their fellow man. People who are tech-savvy, tech-smart, and wise digital citizens and who understand that a misspoken word on the Internet can often destroy like a brick through a window or a baseball bat to the head. But that it can also bring great good and profit! People who understand that the Internet is like the world in which we live -- full of good and bad people. People who know how to protect their own privacy and be their own advocate! This sort of comment from an administrator scares me. Perhaps there is not a legal obligation to prepare students for the outside, but there is a moral obligation in being a teacher and educator. If we spent more time eradicating ignorance perhaps there would not be as many predators to eradicate or we would have more watchdogs out there to help us find them! Doctors promise to do no harm. Educators should promise the same. For truly, sometimes, too much shelter will truly harm those about to be released into an untamed Internet world looking for its next unwitting, unwise, uneducated victim. I love history but that love really developed after I got out of high school. In high school, I had to memorize WAY too much and it sucked all of the joy out of history for me. Rote memorization and the rise of Hitler? My thoughts of rigid discipline of rote memorization pull me hauntingly towards a series of novels I've been reading lately. This particular set of novels are historical fiction and begin in Germany just during the beginning of Hitler's rise and the first one has just concluded as Austria fell without a word. This first novel has haunted me. Because Hitler's rise to power was largely escalated by an "appeasement" policy where most nations and people took the attitude of "I don't care what happens to the helpless in Germany, as long as war doesn't come to my doorstep." Don't get me wrong, many great men and women (Dietrich Bonhoffer comes to mind) did stand up against the wrong of the Reich and paid for it with their lives. However, France's only chance to prevent the German invasion occurred when Germany took the Rhineland. "The forty-eight hours after the march into the Rhineland were the most nerve-racking in my life. If the French had then marched into the Rhineland we would have had to withdraw with our tails between our legs, for the military resources at our disposal would have been wholly inadequate for even a moderate resistance"
We cannot control the times that we live in. We cannot control much. But you and I have control over one thing -- ourselves. And as we are faced with principle -- the things we believe in and know to be true, we must stand up. The time is short. And the most horrifying retreats are made one step at a time. I am quite sick of hearing people throw up their hands in hopelessness about "the kids of today." When I was a child, I heard adults saying those same words. I see it as generational excuse that "it is too hard" to do the right thing. I have my beliefs that I hold dear-- very dear. But underlying every belief of who I am is the importance of diversity and the importance of being able and willing to disagree with manners and nobility. What bothers me most about the country I love dearly and the world that I want to make a better place is that I see that both sides -- both right and left have begun the slow roasting ostracism of those who are not cut out of the very same cloth that they are. These people want teachers to keep their mouths shut and not blog and to standardize everything. Yes, we must be professional. Yes, we need to have some form of testing. But, my goodness, diversity is a beautiful thing! So is creativity! We don't plant monochromatic flowers next to a monochromatic house -- the human eye loves color and diversity. Beauty is something fleeting but it is different for all of us. God forbid the wrinkle in time, Big Brother -like grey uniformity of all being standard. I am concerned. We must be able to work with others without stereotype and with an open mind. The fact that the scientific community seems to be unable to tolerate differing viewpoints whether it is global warming or the discussion concerning a divine entity bothers me. If a theory is a theory, it is disputable by definition and in fact must be disputed to keep the democracy alive. So now, theorists want to claim theories are fact, when in fact, they are still theories. as people stayed quiet, hoping that the problems wouldn't come their way. As they lived in denial, people in Vienna ate strudel and went to concerts up until the moment the country fell. First Jews in Germany hoped that they could just live their lives and not be arrested, then Austria, then Poland, then France, then further and further. Friends of Jews denied them in the hopes that they could retain their own position and exert influence to help. There is no influence gained in compromising the beliefs that make you. Those who compromised, did little in the end to save the millions cooked in ovens of evil. Perhaps it is all wrapped up together. My history teacher who buried the realities of what happened in World War II under some vague dates that I had to memorize and still do not remember. Overstandardization that seems to be robbing the very life out of so many schools. Kids who aren't taught the meaning of what happened and allowed to feel the pain of humanity wearing the blindfold of the pursuit of comfort while a terrible dictator rises to power. People who say, "I'm just going to live through this and not say anything because I'm so close to retirement" or "I can't do anything about it so I'll be quiet" or "It's not worth the hassle to stand up for what's right" or worst of all "There is no hope, I can't change anything and I'll just get in trouble." We need more people willing to respectfully, wisely stand up for their beliefs. Yes, we live in dangerous uncertain times. Our schools are seemingly more violent than ever. However, there is a big difference between separation of church and state and separation of state and morality. Yes, I think technology is important. But goodness, the most important thing in the classroom is the teacher! I am getting more e-mails lately than ever and I have to wonder if it is because teachers are afraid to publicly air their concerns and questions. Now, before you go shake your finger at one political party or another, I would equally lecture both sides. Perhaps I am greatly colored by my time spent in Washington, DC working for Senator Sam Nunn. He was a great statesman. Although he was a Democrat, he honestly, equally worked with both political parties. I often heard in his office to make sure that we knew what HE believed before responding to anyone because he looked at issues and not necessarily at his party. In fact, I think he left the US Senate (where he spent 24 years) because of where he saw things going. We need to teach students to work with people different from themselves. We need to be able to work with people different from ourselves. I relish the opportunity to have meaningful discussions with those who challenge what I think. But I hold true to the fact that we have a right and privilege to disagree. It is an even greater privilege when we can disagree with integrity and mutual respect. There are far too many Jerry Springer-like confrontations that are a shame on the human race. This is why I challenge my students to disagree with me. I often make statements to get them to respond and defend their position. Sometimes I take the opposite viewpoint not necessarily because it is mine but rather because I want them to see the opposite viewpoint. I want to teach them to disagree effectively, with kindness, without interrupting one another. I want them to know how to think and debate effectively as we discuss the ethical issues intertwined with technology and ever aspect of our society. For within the ability to disagree with respect and stand up for the beliefs that make you who you are, are the kernels of greatness. We cannot help the times in which we live, but we can help the life we live in these times. I blog because I want to make a difference. I am just a teacher. I'm a country girl who loves my family and my God more than anything else. But I also believe I'm put in this world to make a difference and to share what I learn with others. I will not be selfish -- I will share. I will not be afraid -- I will speak my convictions with humility and with the knowledge that I will be wrong sometimes in a very public forum and will have to admit my own humanity. I will do my best -- I will work hard to be accurate even when it means admission of being wrong and with the belief that there will always be a job for people who are like me. I will keep perspective -- Technorati is flawed and popularity contests are a waste of time. Yes, it is nice to feel validated but my greatest validation comes from doing a good job in my classroom and at home with my family. "Never believe your own press." Face it, most people don't really know what a blog is. IF they do, they think it is for people who don't have enough to keep themselves busy. (That is what my mom says.) People who become proud become pretty useless. There is a difference in confidence in your ability and thinking you're the center of the universe. I'm part of a larger picture and few if anyone read every word of my blog. But I am part of a positive change, I think. I will enjoy this -- blogging isn't a chore. Blogging is fun! Meeting other educators with a passion to be their best is fun! Yes, things are tough sometimes (especially right now during term paper season) but life is too short to look like you spend your spare time sucking on lemons! I will be true to my beliefs - The most important part of my day is the first thirty minutes where I read my Bible and pray. That is where I honestly believe I tap into supernatural wisdom. However, as true and real as I know it is, I also believe just as strongly in human choice. For it is the fact that I am allowed a choice that I do have the first thirty minutes of my day. People should have a right to spend the moments of their day as they choose, as long as it does not break the law! Perhaps the most difficult attitude I have to learn to tolerate is that of indifference and lack of empathy. I think indifference is a learned attitude for truly, most kids come into this world very inquisitive and very opinionated. don't just "bellyache" DO what you can to make a difference in your corner of the universe. You may retire in May, but that is no excuse to sit back and not speak when something needs to be said. When the child has been labeled, when someone needs a loving hand, when a person needs mercy or when they need tough love. Teachers could make a million dollars a year and not be paid enough. If you're in it for the money -- get out! You can make more money selling copiers. For the most horrendous retreats in history were taken one step at a time. I'm very excited about the conversation that Cheryl, Jen, and I (Sharon is out tonight) will be having with Miguel Guhlin, Doug Johnson (librarian extraordinaire, Blue Skunk Blog) and Dr. Scott McCloud (Dangerously Irrelevant). Show 21 -- Administrative Web 2.0 Supershow! What administrative practices enable effective technology usage by students and teachers? What barriers do administrators create that impede effective technology usage by students and teachers? What are the consequences when few formal school leaders (e.g., principals, superintendents) understand digital technologies? What are university educational leadership programs doing to prepare new technology-savvy school leaders? What can tech departments do to help improve tech skills and understandings by administrators? What kinds of awards and commendations could be given to teachers who are using the tools and how can we showcase best practices. Is the hassle worth it? Do you believe you see gains occur in the classroom when these tools are used? How is technology used to more effectively manage the business side of school operations? Who to answer this one? Should libraries change as part of administrative leadership or have they already? Then, hold on as they field questions and share super cool tools that they use to lead! The show is on tonight at 9 pm EST over at edtechtalk.com -- If you've never listened before, just go to www.edtechtalk.com and click on channel 1. Then, in another window, you can open up the chat room by clicking on chat room, just sign in with your name (no password is required). Then, you'll be in touch with our speakers and able to ask questions. After the show is over, the show is available for download and the chat and show are archived over at edtechtalk.com. Thanks, Eric, for giving me these resources below! "Freedom of speech is the foundation of a functioning democracy, and Internet bullies shouldn't use the law to stifle legitimate free expression. That's why EFF created this guide, compiling a number of FAQs designed to help you understand your rights and, if necessary, defend your freedom." Alas, international readers, this guide is meant for an American audience, however, I believe that EFF's should be started in every country to produce similar guides. This is a great community service! Check out their Bloggers Intellectual Property FAQ and their FAQ about Student Blogging. "In Emmett v. Kent School District, 92 F. Supp.2d 1088 (W.D. Wash. 2000), the court held that public school officials had violated a student's First Amendment rights by punishing the student for his personal website, the "Unofficial Kentlake High Home Page."" "The court held that "[a]lthough the intended audience was undoubtedly connected to Kentlake High School, the speech was entirely outside of the school's supervision or control."" I think this is yet another reason to discuss the ethics of blogs and allow it. If they blog all day at school, are they less likely to do something like this? Blogs are to our society as printed pamphlets were to the American Revolution... the spark for change. And then, I came across this beautiful piece entitled the Ecstasy of Influence as published in February 2007 by Jonathan Letham. Great prep for SAT passages. For those who think that they cannot discuss internet literacy in an English classroom, this piece is proof positive that they are wrong. I am going to print it out and read it with a highlighter because it is almost too much to take in on screen. This is fascinating because I think we often have a one stop- Google finds it all approach and that using multiple sources is an essential aspect of information literacy. "What if you could engage users in a story for about half the time, yet have them remember about 34 percent more of the content?" The study sample only included people from 18-64 so we cannot say it would work for our page design for our students. Shouldn't we be doing eye-tracking usability studies to determine the most effective web page design for learning with students? And, if you want to see the pictures that has the whole blogosphere literally abuzz, scroll down to the bottom of the page and look at the results when they showed the picture of a baseball player on the screen. I think we can deduce this -- edit our stories and make them shorter (I know I know -- I need to work on it myself!) and use graphics to stimulate interest. The 2007 Horizon report is a must read! If you're tired of blazing the trail, this month the folks at Educause and New Media Consortium released the Horizon 2007 report that may astound even you! become an author, a creator, or a filmmaker. These bits of content represent a new form of contribution and an increasing trend toward authorship that is happening at almost all levels of experience." (New Media Consortium 6). The audience is vital but also the authorship that this new audience provides us! As a child, I was taught how to look a person in the eye when I shook his hand to make a good first impression. Now, people make first impression over IM, blogs, wikis, podcasts, videos (oh the videos!) -- you name it! Digital Artifacts - And just as we learn in effective web design that every page may be the home page because of the search engine effect, likewise, every digital artifact has the potential to be a first impression. "information doesn't travel in straight lines"
so a digital artifact created today may literally be found years from now and influence your life. If we teach this mindset that everything we create digitally (even our comments) could be our first impression -- how will students consider the work they post? The new writing - We live in an era where a person who can type rapidly literally has a "leg up" (as long as they have something worthwhile to say). Just ask those who IM with me, I have to be careful at my 130+ words per minute or they literally don't get a word in edgewise! It makes sense that after kids master cursive, that they move to the next form of writing: keyboarding. Putting the ability to write faster than a person talks in the hands of our future is a great gift. And for those who think voice recognition is going to catch up soon, you should listen to the WOW2 podcast with keyboarding expert Patsy Lanclos where we interviewed Sharon Peters' husband (a researcher for Dragon naturally speaking) -- don't expect voice to eliminate the need for typing any time soon. "Increasingly this is the reason students log on." (New Media Consortium 6). The report sees this as a key way to increase student participation in classroom activities. Peer review is an essential element of higher level research. That is what social networking is... peer review. Effective peer review can now be taught at an elementary school level. As serious academicians, we should welcome the opportunity to take peer review to the next level as should college professors and the business world. Do we really want a cure for cancer? I honestly believe that if such difficult problems as cancer and AIDS are to be solved, it will be through the more expeditious sharing and the resulting acceleration of research and learning that could result. In no better way could we hope to accelerate the progress of our generation than by collapsing the information float between the highest levels of academic research. It will require a little humility and willingness to change, but if academicians have knowledge and the welfare of the human race at heart, they should be open to work towards this. I know that colleges have funding and patents and that whole industries have basically outsourced their whole R&D process to higher institutions of learning, however, perhaps companies should consider funding excellent researchers at various institutions and requiring them to communicate with one another via such tools. Could virtual connection and physical disconnection help validate work and promote progress? Just as people with charisma are magnetic and attract others... educational opportunities that use social networking attract the interest of students like magnets. They work! They increase excitement! They make learning more fun! They are great! And teachers meet roadblocks every time they try to connect students -- Yes, we must be wise and vigilant, but we must progress. Everyone is looking for a way to improve the dropout rate! Kids are obviously connecting with more outside the school than in -- "LET THEM CONNECT!" We will be amazed at what we see! If we're scared of the term "social networking" then why not create another term that the critics won't fear? Some ideas: educational networking, learning networks, co-curricular networks -- just be warned that if you make it sound too boring the kids may not want to try it. There is this long standing (wrong) assertion that if it sounds fun its not learning, when in reality, those who have been the greatest scholars have derived an immense amount of joy, passion, excitement, and yes, entertainment out of learning. "I'd like someone to drink this delicious clean glass of dihydrogen oxide." "I'd like someone to drink this glass of water." Names do count and its OK to sound fun and be fun. You can still learn. "There is a time these will be as much a part of education as a bookbag." (New Media Consortium 6). When I went to Georgia Tech in 1987, they strongly encouraged freshmen to have a computer. I believe that some college within the next few years will require some sort of smaller mobile computing device. create, save, edit, and share documents and do just about anything that most of today's computers can do. Oh, I'm sure the experts can envision even more, but this is enough to really get me excited. "The trend is likely to take off in a way that will echo the rise of the web in the mid 1990's" (New Media Consortium 6). Are the simulations and worlds we can create in Web 3d real enough to teach? Which subjects require the real world and which ones are best simulated? These are questions that will form the crux of many a debate in academia with virtual worlds coming into every discipline in some form. Perhaps the greatest potential uses are in the K-12 arena. Perhaps we will also see the greatest opponents. create, critique, and publish are influencing new and old scholars alike." (6 New Media Consortium). It is about being useful. For those who don't think that these tools are useful to facilitate serious academic research, look at how this scholar at my alma mater, Georgia Tech, teaches his fellow researchers how to find scholarly engineering and research articles in the Georgia Tech Library with a video he released on youtube. I believe this video is probably more useful to fellow researcher than a paper on the same subject. In 4 minutes and 56 seconds, they can learn an invaluable skill that will save them hours of time in scholarly research. In another 4 minutes and 56 seconds, they can embed that video onto their own blog to share with others. What if colleges required freshmen to make videos about useful things they had learned -- how much would be shared and how much would be learned to allow those students to progress more rapidly into the intense flow of learning at major universities? The medium should be entirely irrelevant with the focus being on the content and the content producer (are they ethical and qualified) and a high caliber of academic standard and attainment. Less importance should be placed on the location of the content producer and whether they have the connections to get published. I believe that the potential arises for more doctoral students to emerge as world class researchers than in the history of academia. No longer overshadowed by their profs, meritorious work could potentially shine in this new public publication environment. Yes, standards must still be there and in fact must be adhered to more rigorously than ever. (One would not want an exciting day in the lab to turn into an erroneous blog post that announces the cure for cancer that turns out to be false the next day when one learns they have transposed a number!) But, if serious researchers do not put serious standards in place and see blogs, wikis, podcasts, video, and other methods of electronic publication as legitimate publications, then they will have to accept the struggles that will invariably emerge as a result of their negligence. Likewise, as colleges rush to embrace and effectively use these technologies, digital citizenship becomes an essential skill for the serious future businessperson and the serious academician. It becomes equally important as pen, paper, eye contact, and verbal expression. Notice, I did not say it will replace it, simply augment our other forms of communication. Naysayers are always quick to say... "but"
"But it will always be important to write a paper!" "But it will always be important to have good interpersonal skills!" "But it will always be important to speak effectively!" My answer is yes, yes, and yes. "It is always going to be important to write a paper on paper and electronically." "It is always going to be important to have good interpersonal skills for face to face and technology based communications." "It is always going to be important to speak effectively in person or in a video conference." It is not an either / or equation. It is an "and" equation with a big + beside it. We are not removing any form of communication that has existed before, we are simply adding more ways to do it! And some forms will be more appropriate for certain things than others. Yet again, more to discuss. In the coming years, open-source gaming engines will lower the barrier to entry for developers, and we are likely to see educational titles along with commercial ones." (New Media Consortium 6).
" Educational gaming...appears here in two variants: virtual worlds and massively multiplayer educational gaming. Over the past year, it has become clear that these topics, while related, are not simply two sides of the same coin. Virtual worlds are not games, but spaces where many sorts of activities might occur, most of them social. Massively multiplayer games sometimes take place in virtual worlds, but not always. They are more structured, with clear goals and objectives built in, and players interact with the setting in ways that are generally very different than the ways one might interact with the elements of an open-ended virtual world." (New Media Consortium 7). For those seeking to align curricular standards, this should be a dream come true. States could create whole video games around courses. Kids would beg to go to Spanish or Math or English. "You're spending my good tax dollars making a video games so the kids can come down and play all day." "Kids act like they have to be entertained. I wasn't entertained, they sat my rear end in a desk, I sat still and I was bored, but I learned something." "Why are we doing this when no one else is doing it?" In fact, it is often hard to believe for some parents at my school. I have had criticism because "why isn't the local super-wealthy college prep private school doing what I'm doing? " Well, that particular school cut out computer science and put in two years of Latin! We've continued to remind parents that our job is to be the best. 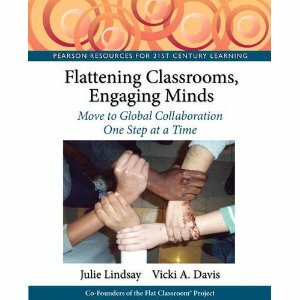 I think that collaborative global skills are more important to the long range health of my students than anything else I can do. They may suffer a couple dozen points on their SAT, but they will be more successful in life, I believe. It is easy to get frustrated, but these changes are coming at the speed of a super wave. And we can look at how surfers conquer formerly insurmountable super waves to find our answers. I recently saw an incredible documentary about how surfers can now ride the super waves. Prior to this, these superwaves only meant death because the currents were too difficult for the surfer to get out to the origin of the waves and if he could, the surfer could not gain enough speed to ride the wave. So, surfers have begun using jet skis to allow them to get on these waves and get them to the proper acceleration. These surfers can use their technical knowledge of how to surf and the technology of the jetski to reach greater heights than in the history of surfing. The same is with us. Academicians, teachers, businesses who wisely harness technology to overcome our weaknesses and use humans to do what we are best at... thinking, creating, theorizing, networking, and more... will ride the superwave of achievement into the future. Some who refuse to acknowledge this superwave will be left behind or crushed, but those who see its potential will have the ride of their life. BIBLIOGRAPHY New Media Consortium. "2007 Horizon Report." March 2007. NMC: Projects and Initiatives. Ed. New Media Consortium and Educause Learning Initiative. 15 March 2007. Math, Web 2.0, Wikis, and connecting with others. A kids ICT conference: Why Not?